For the mincemeat, cut the boiled, cooled lemon in half and discard the pips. Blend the lemon, raisins, sultanas, chopped apple, mixed fruit and mixed peel in a food processor to a paste. Transfer the lemon mixture to a large mixing bowl and add the suet, muscavado sugar, currants, cinnamon, nutmeg, mixed spice, ground ginger, brandy and sherry. Mix together until well combined, then set aside overnight. Blend the flour, baking powder, butter and sugar in a food processor until the mixture resembles breadcrumbs. Turn out the dough onto a lightly floured work surface, knead lightly until smooth, then wrap in cling film and chill in the fridge for an hour. Cut the chilled pastry in half. Roll out one half of the pastry onto a lightly floured work surface to a ½cm/¼in thickness. Using a 7cm/2½in pastry cutter, cut out 15-18 discs (as the mixture allows) and place one into each of the muffin tin wells. Spoon a tablespoon of the mincemeat mixture into each of the mince pie cases and brush the rim of each pastry case with a little beaten egg. 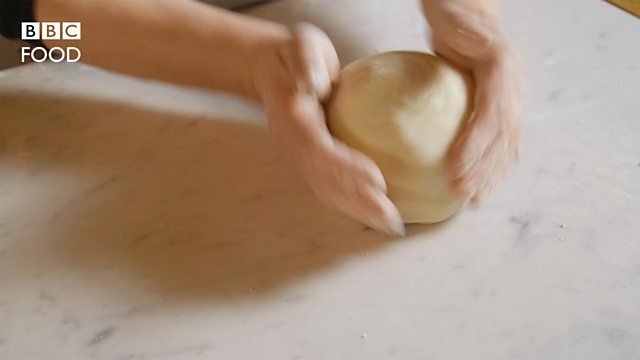 Roll out the remaining pastry onto a lightly floured work surface to a ½cm/¼in thickness. Using a 5cm/2in pastry cutter, cut out 15-18 discs and place one on top of each mince pie. Press together the edges of the pastry to seal. Brush the remaining beaten egg over the tops of the mince pies. Using a knife, make a small steam hole in the top of each pie. Transfer the mince pies to the oven and bake for 20-25 minutes, or until pale golden-brown. Serve warm or cold with whipped cream, brandy butter or ice cream.